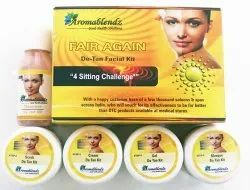 Leading Manufacturer of aromablendz fairness kit, aromablendz skin de-tan facial kit, aromablendz skin whitening facial kit, aromablendz coffee mint foot treatment kit, aromablendz aqua anti cellulite kit and aromablendz toning & anti cellulite kit from Mumbai. As we age the natural collagen & elasticity of the skin reduces & along with constant exposure to harsh environment conditions, wrinkles, crow feet & dull lifeless sking is becoming more common in adults above 30. "Prevention is better than cure. 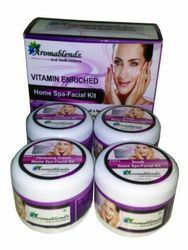 Aromablendz Home Facial Spa Kit gives you the power to restore your skin to its natural self reducing presence of wrinkles & fine lines. Adding years to your skin making you look radiant & young. Scrub: The Fruit extract enriched Blueberry cleansing scrub removes dead skin cells making the skin soft while enriching it with goodness of Vit C making it ready for next step of treatment. Massage for 2 to 3 minutes in circular motion, leave it on the face for 2 minutes & rinse with warm water. Pack: The deep reviving Mulberry pack contains Vit C & Vit A to nourish the skin from within to stimulate natural elasticity & firmness. Application: Apply evenly over face & neck, leave to dry & rinse thoroughly with warm water. Night Cream: The cream deeply nourishes the skin & improves circulation while acting as a trigering for production of collagen Application: apply evenly over face & neck, leave overnight. As we age the natural collagen & elasticity of the skin reduces & along with constant exposure to harsh environment conditions, wrinkles, crow feet & dull lifeless sking is becoming more common in adults above 30. 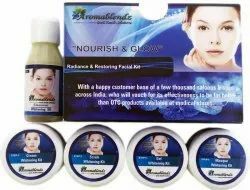 "Prevention is better than cure".Aromablendz Home Facial Spa Kit gives you the power to restore your skin to its natural self. 1)Cleanser: Cleanse with this antioxidant strawberry cleanser to instantly detan the facial skin. Remove dust and dirt till 3 layers of the skin. 2)Scrub: Exfoliate the facial skin with roast coffee granules scrub. This mild coffee scrub mixed with almond oil makes the skin soft. 3)Cream: Facial Massage for brightening skin. Removes tan, sun burn and freckles caused by sun exposure. 4)Gel: Massage this gel on the face to get rid of pigmentation caused by sun exposure. 5)Masque: Apply this masque to get a glowing, blemish free and tan free skin. Tones up the skin and leaves it fresh and glowing. 1)Cleanser: Removes makeup, dirt, dust, and cleanses the skin and makes it ready for the next facial step. 2)Scrub: Exfoliates the skin and opens the pores by unclogging sebum, blackheads and whiteheads Readies the skin for next facial step. 3)Cream: Massage with this cream on the skin helps in skin whitening. It lightes skin tone and gives a luminous effect to the skin. 4)Gel: Massage this gel for deep skin whitening effect. It brightens the skin texture removing freckles and pigmentation. 5)Masque: Use this face masque to remove skin blemishes, dark spots and pigmentation. Also good on skin rashes. Smoothes down the skin after the facial treatment. Tones up and tightens the skin. Clean & well kept Feet, are an indicator of one’s personal hygiene. Everyday our feet endures the worst of abuse due to uncomfortable tight shoes, excessive sweating, bad walking surface & exposure to pollutants on the road. They age faster than any other body part & are most prone to infection. They demand constant care & attention; yet are the most neglected. We offer a complete foot care solution ranging from Foot Soak Salt, Exfoliating Foot Scrub, Antiseptic Foot Mask & Intense Moisturizing Cream, which will do away with the cracks, callouses, dry skin, edgy toenails & all other signs of premature ageing. The kit last for around 35 to 40 treatments reducing the average cost per application to Rs.60. Our products come with a guarantee of Happy smiles from all your customers. We strongly recommend a complete procedure per sitting. Take this treatment twice a week for the first 2 months & thereafter once a week. In the current times multitudes of companies are promising an almost instant weight & fat loss through their magical pills or oils, capitalizing on the “Instant result” psych of the customer. We offer a product that is scientific & consistent in nature. Thousands of customers have benefitted from its “non magical” but scientific formulation. Besides reducing weight & fat, our products are fortified with Aloevera & Protein bonding pre cursers that improve skin tone, elasticity & nourishes the treated part. 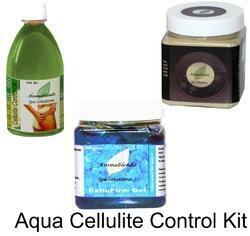 The Aqua Kit consist of Cellulite Control Oil, Cellufirm Gel & Herbal Detox Pack. A G5 massage during gel application is recommended. The Aqua Kit last for approximate 20 to 25 applications & cost per application averages down to a meger Rs.147. We strongly recommend Hot towel application before & during the course of the massage. Ensure a gap of 3 hours between meal before starting the treatment. Take this treatment 3 to 5 times a week. Constant exposure to pollution & ultraviolet rays does extensive damage to the upper layers of the skin, especially our facial skin. Ultraviolet rays are responsible for faster ageing, wrinkles & depletion of natural oil from the skin. In extreme cases are a cause for skin cancer. The kit consisit of a Toner & Cleanser, Exfoliating Scrub, Glycolic Peel, Neutralizer, Deep Moisturizer & Sun Block. The kit last for 35 to 40 treatments/applications, getting the average cost down to Rs.101 per application. With a happy customer base of a few thousand saloons & spas across India, who will vouch for its effectiveness to be far better than OTC products available at medical stores. Take this treatment 2 to 3 times in a month. Get soft, healthy and fragrant feet in just a few minutes a day with our Coffee Foot Care Kit. Foot Soak-Coffee Foot Soak leaves feet feeling refreshed & helps to combat odour-causing bacteria, preparing the feet for further treatment. Sprinkle 10 – 15 gms of cooling soak crystals in a tub of warm water. Soak feet for 10 minutes, rinse & towel dry. Foot Scrub-The polyphenols present in coffee have an ant oxidative effect & reduce cell damage & skin pigmentation due to sun exposure. The intense exfoliating action of the Persian walnut shell granules leave the feet feeling soft & smooth by removing callused & rough skin. Add a little water to improve the effect of the surfactant & massage gently in circular motion for 5 to 7 minutes. Rinse with warm. Foot Pack-The pack has dual effect as it eases the irritation caused due to the scrubbing & soothens out hard layers of dry & calloused skin. Add water till it forms a paste-like consistency. Apply on the treatment area & leave it to dry for 10 to 15 minutes. Cleanse with warm water. Foot Cream-The intense moisturizing & hydrating properties leaves your feet feeling cool & alive. To ensures the benefits of the treatment linger on for the coming days, moisturize once a day. Apply evenly over the treatment area & massage gently. 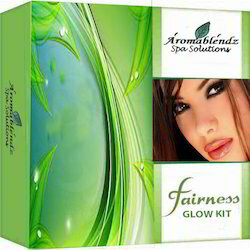 Looking for Aromablendz Sp Combo Product Kits ?